She recently turned 60 years old and that hasn’t stopped Hollywood actress Jamie Lee Curtis from pushing the boundaries when it comes to her fashion. The Halloween star was one of the very special guests at last week’s GLAAD Media Awards in Beverly Hills. The GLAAD Awards, now in its 30th year, recognise and honour media for their fair, accurate and inclusive representations of the gay, transgender, lesbian, bisexual and queer community and the issues that impact their lives. Some of the biggest names in the LGBTQ community attended the ceremony and Jamie took to the stage to introduce her dear friend Sara Cunningham to the audience. Sara is from Free Mom Hugs – a group of affirming parents and allies who love their LGBTQ+ kids unconditionally and take hugs of love and acceptance to others. She also said that she was there to support some of her LGBT friends. For the event, Jamie opted for a stunning see-through top, complete with floral pattern. The outfit allowed the star to show off her curves. The mother-of-two also wore a pair of black high-waisted pants and matching black heels. As always, the Freaky Friday star wore her hair in a stylish short crop for the event. 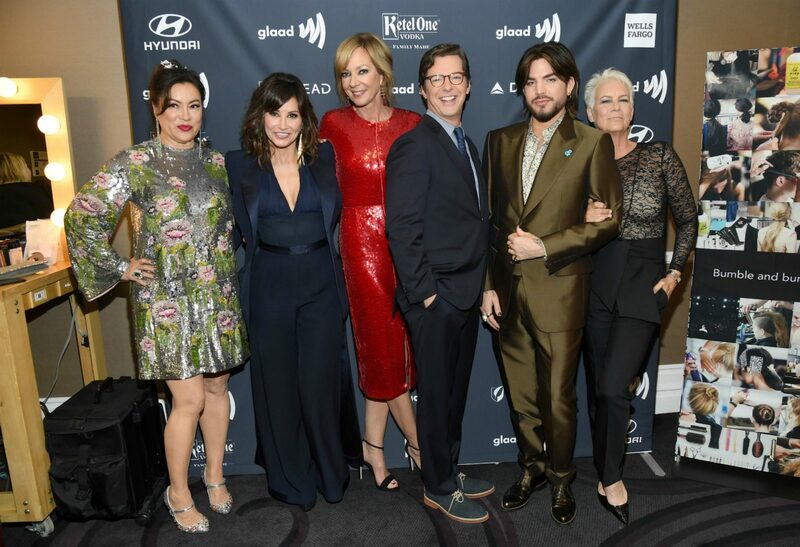 She also happily posed with Will and Grace star Sean Hayes, I, Tonya actress Allison Janney and Queen rocker Adam Lambert at the event. It’s not the first time Jamie has stepped out in a stylish outfit. She recently showed off her fabulous figure at TCL Chinese Theatre in Hollywood in sky high black pumps and a trendy jump suit. The daughter of Hollywood golden couple Tony Curtis and Janet Leigh showed off her slim figure as she paired the stunning outfit with a simple, cropped black jacket. She chose a beautiful silver bangle and small silver studs to match with the jumpsuit and a chunky watch. Meanwhile, she kept her makeup to a minimum going for a soft pink lip, dark mascara and a touch of bronzer to highlight her cheekbones. Are you a fan of Jamie’s style? What do you like to wear on a night out?